Launched in 1971, Adolescent Psychiatry, in the words of founding coeditors Sherman C. Feinstein, Peter L. Giovacchinni, and Arthur A. Miller, promised "to explore adolescence as a process . . . to enter challenging and exciting areas that may have profound effects on our basic concepts." Further, they promised "a series that will provide a forum for the expression of ideas and problems that plague and excite so many of us working in this enigmatic but fascinating field." For over two decades, Adolescent Psychiatry has fulfilled this promise. The repository of a wealth of original studies by preeminent clinicians, developmental researchers, and social scientists specializing in this stage of life, the series has become an essential resource for all mental health practitioners working with youth. 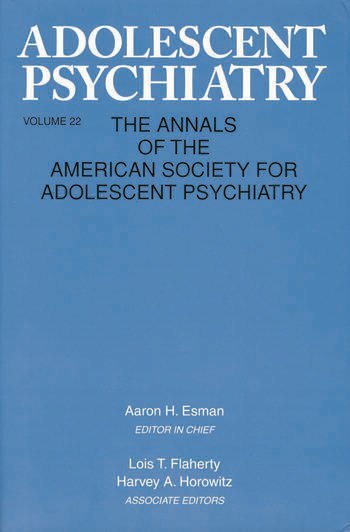 With volume 22, the editorship of Adolescent Psychiatry passes to Aaron E. Esman, a distinguished clinician and educator whose wide-ranging sensibilities gain expression in a collection rich in clinical, developmental, and scholarly insight. Encompassing developmental topics (adolescent daydreams) timely clinical issues (eating disorders, impulse control disorders, narcissistic and antisocial pathology), historical commentaries (Shakespeare's adolescents, Nietzsche's romantic construction of adolescence, Freud's Dora as an adolescent), and a special section on "ambient genocide and adolescence," volume 22 ably meets the needs of professional and scholarly readers interested in this vitally important stage of life. Part I: Adolescence: General Considerations. Horowitz, Adolescent Daydreams and Creative Impulse. Esman, Shakespeare's Adolescents. Rakoff, Nietzsche and the Romantic Construction of Adolescence. Part II: Clinical Issues in Adolescence. Jeammet, Chabert, A Psychoanalytic Approach to Eating Disorders: The Role of Dependency. Hendren, Butler, Impulse Control Disorders in Adolescents. Miller, Psychiatric Contributions to Improve the Effectiveness of Juvenile Justice. Glenn, Dora as an Adolescent: Sadistic and Sadomasochistic Fantasies. Kernberg, The Diagnosis of Narcissistic and Antisocial Pathology in Adolescence. Part III: Adolescence in Social Crisis. Erlich, Adolescents' Reactions to Rabin's Assassination: A Case of Patricide? Special Section: Ambient Genocide and Adolescence. Shaw, Narcissism, Identity Formation and Genocide. Stein, Working with Adolescent Victims of Ethnic Cleansing in Bosnia. Sugar, Adolescent Genocide. Kalogerakis, Adolescent Violence - Twentieth Century Madness: A Critical Review of Theories of Causation.